Bali Hai Cruises has spent decades delighting families while cruising in the waters around Bali and Nusa Lembongan. We offer day cruises, day sailing trips and evening cruises which appeal to a wide variety of tastes. From the excitement of zipping around on our 3-Island Ocean Raft to the relaxation of our Bali Beach Club Cruise, we have something for everyone.All cruises depart at their scheduled times from Benoa Harbour in South Bali. We will pick you up from your accommodation prior to departure. Experience the unspoiled charms of a peaceful tropical island with our Beach Club Cruise to Lembongan Island. You are transferred to our private Beach Club only minutes away from the pontoon. Here you can relax on golden sands, lie back in the shade of the tranquil gardens, or cool off in our lagoon pool. If the mood takes you, an array of activities to add to the tropical atmosphere there is an appetizing BBQ lunch, which includes salads and fresh fish grilled at our pool-side cabana. ​Our Island Reef Cruise offers a full day’s activities - above and below the water. The luxury Bali Hai II catamaran moors alongside our purpose-built pontoon in peaceful Lembongan Bay. See the island’s exotic marine life and colorful corals from the comfort of our semi-submersible coral viewer. Try snorkeling for a closer look or enjoy a host of other activities: unlimited banana boat rides, a cultural tour of the island or our exciting 35m water slide. And when you’ve worked up an appetite, feast on a delicious buffet served in air-conditioned comfort. ​There’s no better way to spend a balmy tropical evening than on Bali Hai’s evening Dinner Cruise. As the sun goes down we set off on a relaxing cruise around the harbour. Take in the cool night air on the top deck, be entertained by our live musical entertainers at the bridge deck, savour a delicious international buffet dinner, then dance the night away at our disco or enjoy our live cabaret show. ​Experience Bali’s fastest and most exciting full day cruise as you discover the magnificent sights of Bali’s three sister islands. Ocean Rafting, designed with the highest safety standards and equipped with 750hp, promises an exhilarating day of sight seeing and snorkeling at some of Indonesia’s finest pristine coral reefs. We booked the sunset dinner cruise through Putu at Tic Bali Holidays, got a great discount and it even included free transfer from our hotels which was great. The night we were booked to go the weather was not looking very good....but we were greeted in the undercover area with a lovely cool drink and a fresh frangipani lei each. After a short wait we were all invited to board the boat, and enjoyed a couple of drinks with canapes on the top deck as we took off. We were watching the storm come in, it became very dark, very quickly! The staff timed it perfectly, and ushered us all downstairs just as it started to rain. ​and we will definately be back! 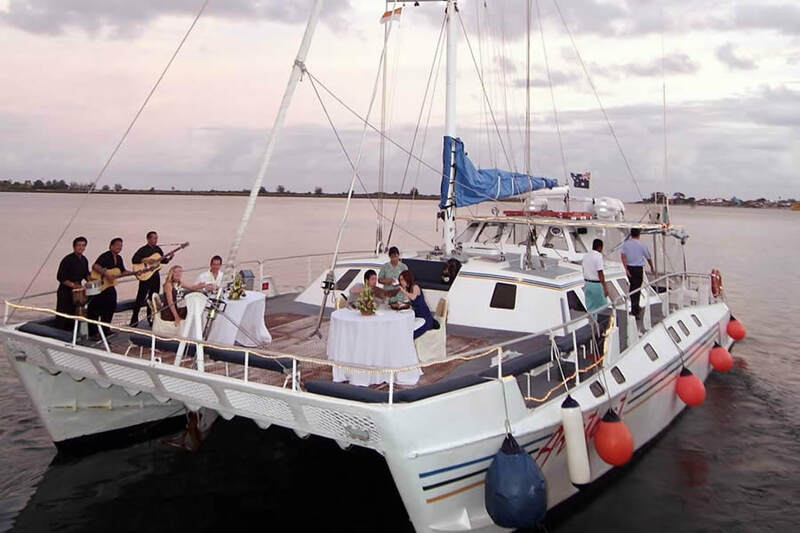 ​Enjoy Bali’s finest evening cruise aboard Aristocat, Bali Hai’s luxury catamaran. tropical night air, whilst being serenaded by the sound of live music . Aristocat, strewn with twinkling lights, will set sail towards Nusa Dua for an evening of fine dining and entertainment. From the scrumptious fresh food to the sounds of the sea, our Aristocat Evening Cruise promises a truly memorable evening as you watch the sunset across the South of Bali.